A few people have asked me why I jailbreak my iOS device, and what aftermarket jailbreak packages I install on my device for what purposes. Instead of answering this over and over, I figured I’d go ahead and make a list here of some of the things I use on my iDevices. Activator - allows you to specify gestures for various functions and/or apps. For example, I can swipe up from the bottom left of the screen to bring up a quick entry text message window via BiteSMS. Makes life easy and fast for commonly used things. Free. 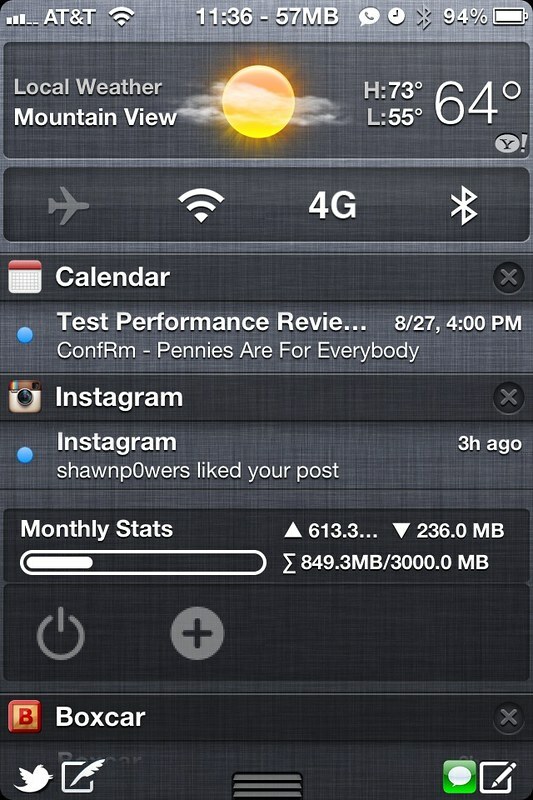 From top to bottom: SBSettings and OpenNotifier; Weather; NCSettings; Calendar, Instagram, WeeTrackData, and QuickTweet/BiteSMS for rapid tweeting/texting. BiteSMS - an iMessage-capable SMS replacement program. Supports group messaging, quick reply, scheduled messages, and a ton more. Recommended if you do any texting at all. $7.99. Multicleaner - Provides a quick method to close apps for better memory management. $0.99. NCSettings - Puts a bunch of toggles for wifi, Bluetooth, cellular data, and other system-level functions in your Notification Center so you can quickly toggle things with a couple swipes. Uses icongraphy that matches the black/white icons of the iOS status bar. Free. OpenNotifier - This hack can put little icons near the battery indicator on your iDevice when new mail/IMs/texts are received. Very handy to see if you have messages waiting without unlocking your device. Free, but there’s an optional icon pack (OpenNotifier Premium Pack) that’s $0.99. Bottom line is, there’s a bunch of packages that let you extend the functionality of your iOS device in ways that Apple never intended. Don’t be afraid of jailbreaking, it’s pretty neat stuff. 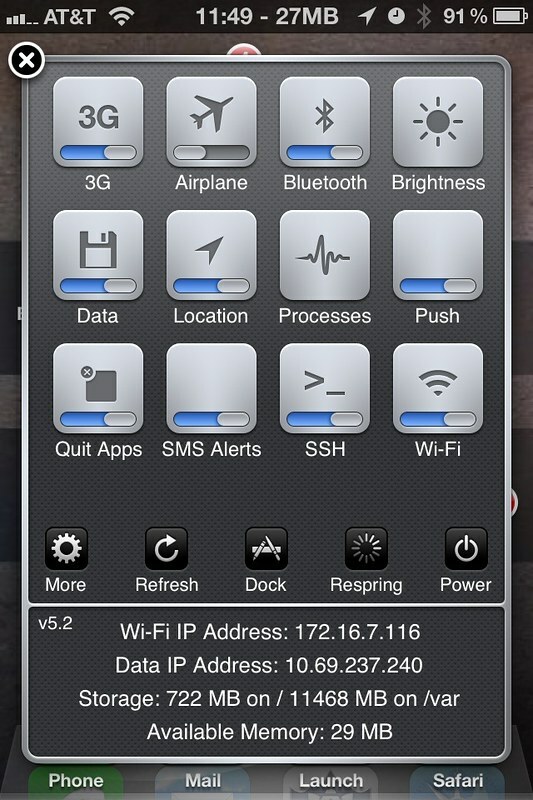 Oldie but goodie, gives you single-swipe toggles plus IP address info, etc.